NEW! 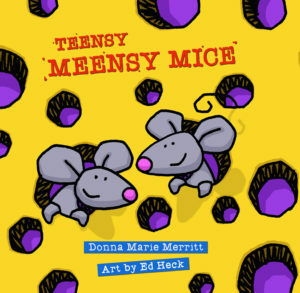 Teensy Meensy Mice follows the rambunctious adventures of mischievous mice who use a family's house as their own personal playground at night. They may be teensy meensy, but these mice get into BIG trouble! Illustrated by Ed Heck. April 2nd is National PB & J Day! CLICK HERE for a free, downloadable Meensy Mice coloring page. Come back each month for a new page, courtesy of Ed Heck and the teensy meensy mice! Hush That Hullabaloo! is a rollicking, rhyming, read-aloud set in Scotland, full of Scottish words that will delight readers as they repeat the catchy phrases and imitate a Scottish brogue. 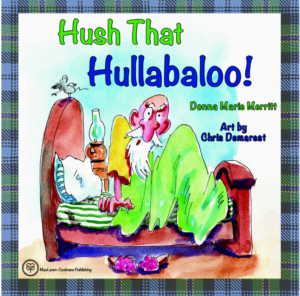 Grandpa Goose is grouchy as the lads and lassies make a mess in his "hoose" and lots of noise—a hullabaloo! Grandma soothes him with the refrain, "Wheesht, wheesht, / It's only the wee ones. / Wheesht, wheesht, / Only the wee ones." Can you figure out what the hullabaloo is all about before Grandpa Goose does? Illustrated by Chris Demarest. Tina has had a growth spurt. Now she's taller than her third-grade classmates—and she doesn't like it one bit! What's so great about being tall anyway? Tina's friends help her to discover some terrific things about being tall while they learn math comparison terms along the way. Contact Abrams Learning Trends for Donna's preK to grade 3 math and science books. The following titles are "big books" with velcro pieces that invite children to take part in the action. Each also comes with a teacher's guide. Classroom teachers can add little-book versions in sets of six. Donna Marie Pitino/Merritt writes under a number of pseudonyms, so it's best to request by title, not author. Playground Science: Pushing, pulling, using simple machines . . . playing is hard work! How Scientists Observe: Scientists look at things with microscopes, binoculars, and more. 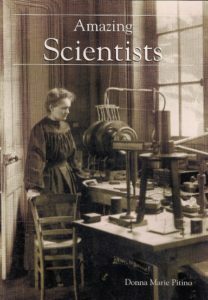 Amazing Scientists: Discover three scientists who changed our world. Sun and Shadows, Sky and Space: Learn about the Sun and the Earth. My Wonderful Body: Find out how to keep your wonderful body healthy! Let's Eat! What healthy foods would you like to eat? The Water Cycle: Where do we get water and how do we use it? Are They Equal? Is the number of things in each group the same? Let's Figure It Out! Math helps you to figure things out every day. Is It Likely to Happen? Is it likely to snow on a hot day? Discover probability. What Time Is It? What time do you do things each day? How Else Can We Show It? Show what you know with different kinds of graphs. Let's Measure with Tools: Which tool will you choose to use to measure things?